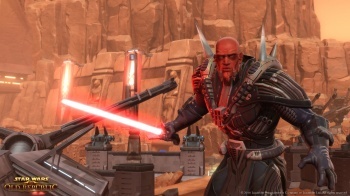 The Old Republic's publisher says that the game will have a wide reaching appeal. EA might be carefully managing the Star Wars: The Old Republic launch, but it says that it has taken steps to ensure that Star Wars fans aren't disappointed by a lack of copies of the game over the holidays. EA's Frank Gibeau says that the publisher's launch plan is ambitious and that he doesn't think that too many people will have to wait. "We don't feel like we're going to be leaving too much demand behind at launch but we definitely are going to be very cautious and thoughtful about how many people we bring on and in what order," he said. "It's a very interesting proposition from that standpoint because you have the Star Wars brand that draws in a lot of people. That is a good thing because we think we can sustain the business over a very long time as we grow. There's going to continually be new customer segments that we can open up and bring into the service." Gibeau said that EA was using The Old Republic's beta to see what how many people the game will be able to handle at launch, and that the pre-order campaign was designed with those limits in mind. Back in August, EA also said that there would be a finite number of copies of the game available online, so not to overload the servers at launch. Star Wars: The Old Republic comes out for PC on December 20th.